Have a 'War of the Worlds' Radio Party This Halloween! 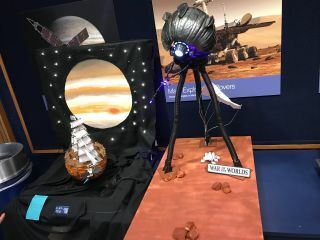 Engineers at NASA's Jet Propulsion Laboratory in California made this pumpkin "War of the Worlds" tribute for Halloween 2017. Eighty years ago this week, "War of the Worlds" aired across the country and secured a creepy legacy for Grover's Mill, New Jersey. For Halloween this year, why not take a listen yourself to the historic broadcast? You can relive the terror for yourself with the full broadcast audio embedded below, courtesy of Archive.org. Or throw a listening party and pretend the civilization-destroying forces are coming from out of this world.